Chateau Jas de Bressy dates back not too far. The vineyard was purchased in 2003 from the Trintignant family. The wine was bottled and sold by the new owners in 2005. The name takes its inspiration from the translation of Jas, which means small stone house or less formally, a shepherds hut. The owners, the Mousset Barrot family also own Chateau des Fines Roches, (The Hotel and the vineyard) as well as Domaine des Saumades. Both estates are also located in the Southern Rhone Valley. The owners of Chateau Jas de Bressy also own 74 hectares of vines in the Cotes du Rhone appellation where they produce du Bois de la Garde Rouge, and a Cotes du Rhone Villages wine. They also produce a Vin de France. 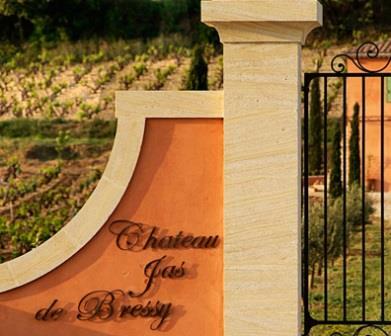 Chateau Jas de Bressy owns 5.5 hectares in the Chateauneuf du Pape appellation. 4.5 hectares are used to produce red wine and 1 hectare, located in the estates cooler terroir is planted with white wine grape varietals. They have old vines. Some of their Grenache is more than 80 years of age. The terroir for the red wine grapes is gravel with small rocks on top of a sand and red clay subsoil. Chateau Jas de Bressy produces two wines. 1 red Chateauneuf du Pape wine and one white Chateauneuf du Pape Blanc. Chateau Jas de Bressy Chateauneuf du Pape Rouge is produced from a blend of 80% Grenache, 15% Syrah and 5% Mourvedre. The Grenache vines are more than 80 years of age. The terroir is rocks, stones and clay soil in the la Petite Bastide, la Petite Bastide vineyard. The wine is vinified in stainless steel tanks and then it’s aged in a combination of used French oak barrels and old foudres, with the different grape varieties receiving different aging treatments. The Grenache is aged in the foudres. The Mourvedre and Syrah are aged in old, used, small French, oak barrels for 18 months before blending and bottling. The production is on average, close to 1,000 cases of wine per year. Chateau Jas de Bressy Chateauneuf du Pape Blanc is made from an even split of 50% Grenache Blanc and 50% Roussanne. The wine is vinified and aged in a combination of used, small oak barrels and small concrete tanks. The wine is aged on its lees for an average of 9 months before bottling. The production is close to 125 cases per year. Chateau Jas de Bressy can be enjoyed on the young side. Young vintages can be popped and poured, or decanted for about 1 hour, give or take. This allows the wine to soften and open its perfume. Older vintages might need very little decanting, just enough to remove the sediment. Chateau Jas de Bressy is usually better with 2-4 years of bottle age. Of course that can vary slightly, depending on the vintage. In the best vintages the wine should be consumed within 3-12 years after the vintage. Chateau Jas de Bressy is best served at 15.5 degrees Celsius, 60 degrees Fahrenheit. The cool, almost cellar temperature gives the wine more freshness and lift. Chateau Jas de Bressy is best served with all types of classic meat dishes, veal, pork, beef, lamb, duck, game, roast chicken, roasted, braised, stewed dishes, sausage, barbecue and cassoulet. Jas de Bressy is also good with Asian dishes, hearty fish courses like tuna, mushrooms pasta, eggplant, cheese and tomatoes. The white wine of Jas de Bressy is best served with a myriad of different seafood dishes, shellfish, crab, lobster, sushi, sashimi, chicken, pork and veal, as well as Asian cuisine. Medium bodied, elegant soft, bright, sweet and fresh, the finish, juicy, spicy and sweet. The wine was made from 80% Grenache, 15% Syrah and 5% Mourvedre. Medium bodied, polished and forward, this soft textured, open wine offers an elegant styling to its cherry core of peppery fruit. The wine was blended using 80% Grenache, 15% Syrah and 5% Mourvedre. Medium bodied, soft, polished, peppery sweet, red fruits with a dab of licorice to complicate things. The wine is forward and will show its best characteristics in its up-front youth. Medium bodied, soft, bright and fresh, with a red plum and cherry finish. Silky, smooth and polished, the fruit with its ripe, spicy qualities really stand out in this Grenache dominated blend. Round textured and supple, the wine has a plush, polished spicy personality with ample, fresh, sweet red fruits. Deep, dark, ripe, floral and spicy, the wine pops with kirsch, fennel and earthy sensations. Medium bodied, soft, fresh, silky and stylish, with a nice core of ripe, kirsch, black raspberries, herbs and fresh cracked peppery notes. This is already drinking close to peak, it's a reasonably priced, wine of pleasure, but it's not going to be a long ager.